In this passionate, lucid, and surprising book, Timothy Morton argues that all forms of life are connected in a vast, entangling mesh. This interconnectedness penetrates all dimensions of life. No being, construct, or object can exist independently from the ecological entanglement, Morton contends, nor does "Nature" exist as an entity separate from the uglier or more synthetic elements of life. Realizing this interconnectedness is what Morton calls the ecological thought. In three concise chapters, Morton investigates the profound philosophical, political, and aesthetic implications of the fact that all life forms are interconnected. 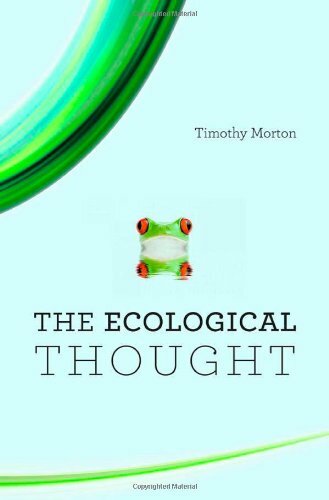 As a work of environmental philosophy and theory, The Ecological Thought explores an emerging awareness of ecological reality in an age of global warming. Using Darwin and contemporary discoveries in life sciences as root texts, Morton describes a mesh of deeply interconnected life forms-intimate, strange, and lacking fixed identity. A "prequel" to his Ecology without Nature: Rethinking Environmental Aesthetics (Harvard, 2007), The Ecological Thought is an engaged and accessible work that will challenge the thinking of readers in disciplines ranging from critical theory to Romanticism to cultural geography.